Figure 1. Tourists admire the “El Castillo” pyramid at the site of Chichen Itza in Yucatán, Mexico. Archaeological sites in the Yucatán Peninsula are among the leading attractions for a thriving tourism industry and have helped to significantly boost the local economy since the 1970s. While the success of tourism has provided many economic benefits for the millions of people who live in the region, it has also created a slew of undesirable consequences. Among the most publicized negative impacts have been major spikes in crime and pollution, but tourism has also influenced the way local culture and heritage are economically and socially valued. This is especially true for the large population of Maya living in the modern states of Campeche, Quintana Roo and Yucatán in the Yucatán Peninsula, who have been compelled to reconceptualize their heritage as a commodity to meet the demands of the hordes of tourists that travel to the region every year. Figure 2. Billboard in the Yucatán Peninsula, Mexico, advertising Chichen Itza. Popular media portrayals of Maya cultures and peoples have played an important role in creating an international ideal that has framed the ways that the tourism industry depicts the Maya past and present. Archaeological research has also inadvertently played a role in creating the Maya archetype. In particular, a fixation on the Classic Period (250–900 CE) has resulted in a disproportionate focus on pre-Hispanic Maya history. This is problematic given the relevance of post-Conquest events, such as the Maya Caste War of the 19th century, to shaping the identities of modern Maya peoples and communities. Using the city of Tihosuco in Quintana Roo as a case study, this article explores the complex intersections of tourism, media, archaeology and heritage and proposes avenues for change moving forward. Figure 3. Employee of the Maya Caste War Museum presents a lesson in Maya counting. Situated within the Maya region of Mesoamerica, the aptly named Riviera Maya refers to the tourist zone that runs along the eastern coast of the Yucatán Peninsula of Mexico. Tourism in the region began in 1970 with the construction of the first hotel resorts in what would become the city of Cancún. Since then, the ongoing development of tourism in the region has created hundreds of thousands of jobs, and the industry has become the principal means of income for the entire region. By 2017, Cancún had become the largest city in the region, welcoming nearly 6.8 million international tourists annually. This means that far more people visited Cancún last year than live in the entire Yucatán Peninsula. Resort hotels and cruise ships take advantage of their location within the Maya region by hosting excursions to archaeological sites such as Chichen Itza and Tulum that each welcome (or endure) over 2 million tourist visits per year. While increased tourism to archaeological sites is indicative of a high level of interest in Maya history and culture, it has also meant that Maya people living in the region today are financially mo- tivated to capitalize on their own heritage. Figure 4. 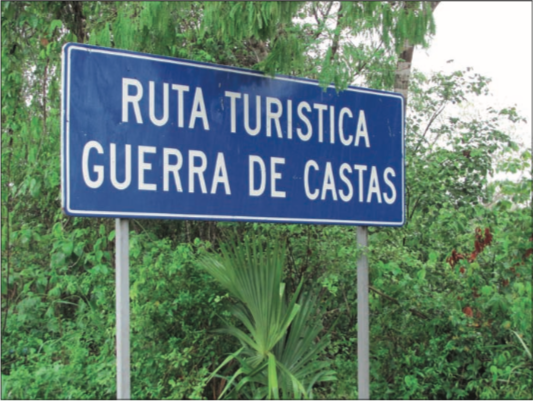 Road sign near Tihosuco, Quintana Roo, Mexico, marking the Maya Caste War tourist route. 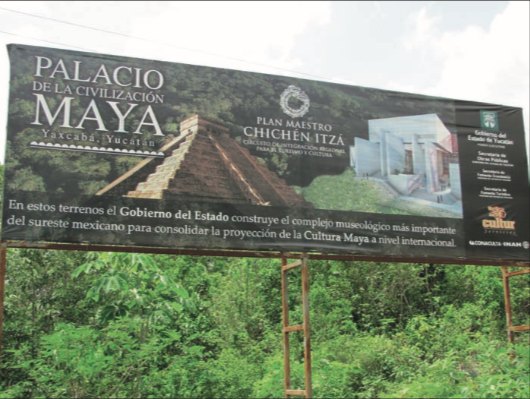 Compare with the billboard for Chichen Itza in Figure 2. Today, Maya people make up a large portion of the population living in the Yucatán Peninsula. It is estimated that there are nearly 800,000 speakers of Yucatec Mayan and perhaps as many as 2 million people who identify as Maya. Even by the most conservative estimates, Maya people make up at least 18 percent of the region’s permanent population of about 4.5 million people. While a considerable number of Maya people live in the Yucatán Peninsula today, the Maya past — and particularly the “ancient” past — continues to be the most widely publicized and marketable avenue for public understanding of the Maya. Figure 5. 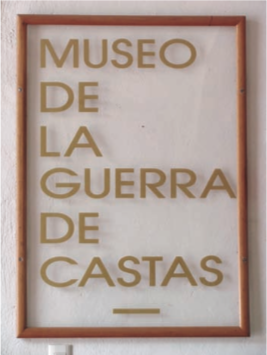 Plaque at the entrance of the Maya Caste War museum in Tihosuco, Quintana Roo, Mexico. One of the results of the influx of international tourism in the Yucatán Peninsula has been the emergence of a Maya archetype — a generalized ideal of the Maya. Although a wide range of characteristics can be interchangeably projected onto the Maya archetype, it is defined by only a handful of common traits. Within this framework, the Maya are broadly characterized as an “ancient” people, though the exact time frame of their existence is intentionally left vague. Popular media narratives depict “the Maya” as having been intellectually gifted, especially renowned for their complex calendrical and writing system and impressive artistry and engineering. They are also depicted as having been exceptionally violent or “blood-thirsty,” as well as masters of astronomy with a penchant for divinatory or prophetic practices. Figure 6. Outdoor patio exhibit space at the Maya Caste War Museum in Tihosuco, Quintana Roo, Mexico. While not completely inaccurate, these characteristics of the Maya archetype reflect a sensationalized and oversimplified under- standing. Despite its inherent problems, the Maya archetype is useful within the context of a tourism-based economy because it is a straightforward concept that can be easily evoked through images and symbols. These images and symbols are easily commoditized because they can be reproduced in a wide range of mediums and sold — sometimes as objects and sometimes as part of a larger performance or experience. As a result, the Maya archetype has become a marketing fixture made readily accessible to the millions of tourists who visit the region annually. The Mayan civilization dominated Central America for nearly 2,000 years, but by the 9th century A.D., the great Mayan cities were abandoned, and the Mayan people vanished. What could have happened to this advanced culture? Might the Maya have left clues as to how they surpassed other cultures in science, mathematics, time keeping, and most importantly, astronomy? In recent years, hieroglyphs have been decoded to reveal that the Maya were able to accurately predict shifts in the Earth’s axis every 26,000 years. Inscriptions on the sarcophagus of their most prominent ruler, King Pakal, tell of a journey to the Milky Way. And a sophisticated calendar foretells of the end of the world in 2012. Most striking is their belief that knowledge was passed to them by otherworldly beings who descended from the sky. Could the ancient Maya have actually conspired with extra- terrestrial visitors to plan the future — and even the very end of the world? Putting aside the fact that the synopsis makes the xenophobic argument that the Maya depended on the aid of extraterrestrials to accomplish some of their most impressive feats, it also reinforces many of the most common characterizations of the Maya archetype. The synopsis also perpetuates one of the most harmful myths about the Maya — that approximately a millennium ago, and for reasons that are still unexplained, the Maya disappeared. While many other media depictions of the Maya are overly general or sensationalized, this one is especially harmful because it is completely inaccurate. While it is true that between the eighth and 11th centuries CE many of the most important Classic period Maya cities were rapidly depopulated due to a diverse range of social and environmental factors, Maya people did not disappear and, in fact, continue to live in the region. The myth of the disappearance of the Maya — often associated with the Classic Maya collapse — is marketable within the context of a tourist economy because it projects an element of mystery. However, it is also damaging because it disconnects living Maya people from their ancestors. The widespread belief that the Maya disappeared ignores the thousand-or-so years of history that have transpired since the “disappearance” of the Maya. Although the Maya have had a long and important legacy in the Yucatán Peninsula, with many pivotal events long after the fall of many of the major Classic period cities, these histories remain invisible to most tourists. Figure 7. 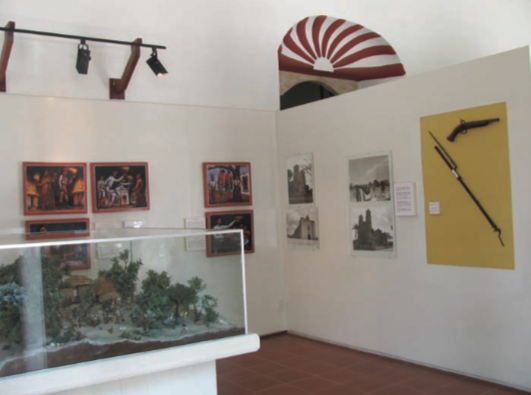 Interior of the Caste War Museum in Tihosuco, Quintana Roo, Mexico. While popular media have played an important role in defining and publicizing the Maya archetype, the romanticization of the ancient Maya is not a recent phenomenon. The impressive monuments and structures of the Maya have been marveled at since the arrival of the Spanish in the early 16th century. Some of the most influential information about the Maya emerged during the 19th century when many of the first antiquarians and world travelers from the U.S. and Europe made their way into the region. John Lloyd Stephens and Frederick Catherwood were among the most famous of these early explorers and are often credited with the “rediscovery” of the Maya. On their journey, Stephens and Catherwood visited 44 Maya sites, which Stephens wrote about in great detail in his account Incidents of Travel in Central America, Chiapas, and Yucatan (1841). Figure 8. Statue of Caste War Revolutionary General Jacinto Pat in Tihosuco, Quintana Roo, Mexico. Travel accounts such as this were one of the most popular media platforms of the time. Catherwood, an architect and skilled draftsperson, created incredibly detailed drawings of archaeological monuments and structures. Although the work of Stephens and Catherwood has been extremely useful and continues to inform archaeological research today, the tone and sentiments of their work mirror many misconceptions about the Maya that persist today. On their quest to learn more about the Classic Maya and the impressive objects they left behind, Stephens and Catherwood exhibited a kind of tunnel vision, valuing only one period in the long existence of the Maya peoples and culture. Inspired by the work of world travelers such as Stephens and Catherwood, many early Maya archaeologists also tended to romanticize the ancient Maya. Elite structures and monuments were given a great deal of attention while the remains of Maya commoners were largely ignored. The earliest Maya archaeologists also dedicated a great deal of time to understanding the iconography and writing of the Maya, which was largely created by and for elites. Thus, early archaeological research of the Maya over-emphasized the lives of kings, shamans and warriors, which is mirrored in the depictions of the Maya found in the media and marketed to tourists today. Figure 9. 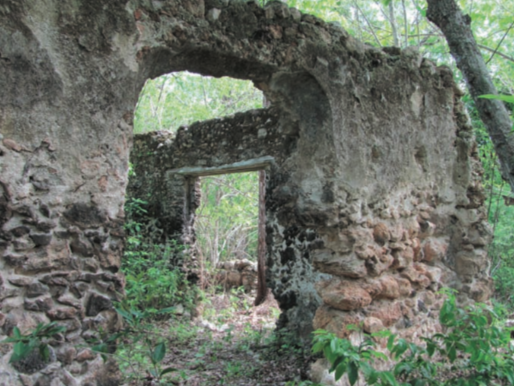 Ruins of Culumpich, the Hacienda of General Jacinto Pat, located just outside of modern-day Tihosuco, Quintana Roo, Mexico. Like the explorers and antiquarians that came before them, early Maya archaeologists were almost exclusively interested in the remains of the pre-Hispanic Maya. Even today, comparatively little archaeological research has explored the more recent history of the Maya region, and the research that has been done is less publicized. This has resulted in a general lack of knowledge concerning Maya history after the Classic period and inadvertently lends credence to the myth of the Maya disappearance. Although contemporary archaeologists have worked hard to correct the biases of their predecessors by increasingly working in commoner contexts and by investigating more recent periods, the biases and misconceptions generated by early research have had incredible staying power. The corpus of archaeological literature on the Maya remains uneven, and this has certainly contributed to popular media portrayals of the Maya. Thus, intentionally or not, the research interests of archaeologists have influenced public perceptions and contributed to a lopsided understanding of the Maya. Long before tourism emerged as the major economic market in the Yucatán, the romantic ideal of the Maya was already widespread. However, it was not until the rise of the tourist industry that living Maya people stood to gain economically from widespread interest in their heritage. References to the Maya are ubiquitous across the Peninsula and are infused into nearly all tourist attractions. However, these versions of Maya history and culture do not reflect the experiences and values of living Maya people, but are calculated expressions of Maya-ness created to entertain and impress tourists. As an industry, tourism depends on meeting the expectations of visitors, which means that “outsiders” rather than “insiders” determine what is of economic value. Within this model, tourists determine the versions of culture and history they see — regardless of their accuracy or significance to descendent populations. Xcaret is just one of the many tourist attractions along the eastern coast of the Yucatán Peninsula that has capitalized on a widespread fascination with the Maya. Located a little over an hour’s drive south of Cancún, Xcaret is a theme park marketed as a destination that has something for everyone. The list of attractions is extensive and includes everything from wine tasting to swimming with dolphins. The Maya are referenced in many different contexts throughout the park, and the “Caves to the Mayan Village” attraction is intended to provide an immersive experience of the Maya past. The attraction leads groups of tourists through a series of “secret passageways” until they arrive at a replica Maya village. Once inside the replica village, tourists are treated to a 20-minute performance wherein men and women decked out in elaborate costumes and full-body paint dance and chant, mimicking Maya rituals. Smoke emanates from cauldron-like vessels and torches frame the stage. This attraction evokes the same sensationalized Maya archetype that is perpetuated across the Riviera Maya. It is a finely tuned representation of what international visitors expect or value about Maya culture and is more reflective of the preferences of tourists than it is of any authentic heritage. Thus, tourism has resulted in a situation wherein great financial stake has been placed on the values of outsiders, and therefore the heritages and histories of living Maya people are eclipsed by a romanticized past. While the widespread depictions of the Maya may be broadly understood as heritage, they do not always accurately reflect the patrimony of living Maya people as they see it. Maya people living in the Yucatán today are financially compelled to commoditize essentialized versions of their heritage, and to conceal or ignore others, to meet the expectations of international tourists. All this is not to say that the Maya of the Yucatán Peninsula do not identify with or take pride in their pre-Hispanic predecessors. Countless ethnographies have recorded the persistence of ancient practices among Maya communities, and Maya people who live near pre-Hispanic archaeological sites have acknowledged the sense of stewardship they feel toward the relics of their ancestors. 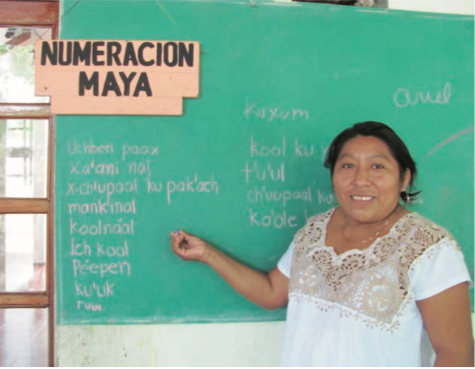 Furthermore, survival of Mayan languages despite centuries of Spanish and Mexican oppression also attests to a desire to retain an independent identity that beckons back to their pre-Hispanic roots. However, other histories have also played an important role in defining how contemporary Maya people define themselves. Despite the fact that tourism has created a market that disproportionately values the pre-Hispanic past, Maya people living in the Yucatán Peninsula today have found ways to memorialize their more recent history within local landscapes. A millennium has passed since the majority of Classic Maya sites were largely abandoned, and in the years since this “collapse,” countless events have unfolded that shape the way Maya people today conceptualize their identity and heritage. In particular, contemporary Maya people take pride in their legacy of resistance. Although the Maya were among the first indigenous people to interact with European explorers, they were notoriously recalcitrant and difficult to conquer. Even after the conquest and colonization of the Yucatán Peninsula, uprisings were common. These continued long after Mexico gained independence from Spain in the early 19th century. In fact, one of the most significant and prolonged uprisings, now known as the Maya Caste War, occurred in the second half of the 19th century, lasting roughly from 1847 to 1901 CE. Although the Maya were ultimately defeated, the duration and temporary success of the Maya Caste War makes it one of the most important events in recent history. The War is remembered and commemorated in towns throughout the Yucatán Peninsula. One town that has employed diverse strategies to memorialize the Maya Caste War is Tihosuco in the state of Quintana Roo. Tihosuco is home to approximately 5,000 people, the majority of whom speak Yucatec Mayan. Tihosuco is located 70 km south of the well-known Colonial city of Valladolid and only slightly farther from the largest archaeological attraction in the region, Chichen Itza. Despite being relatively close to these tourist attractions, Tihosuco is still off the beaten path of tourist traffic and has not benefitted financially from tourism to the same to degree as other communities. Nevertheless, Tihosuqueños are well aware of the economic significance of tourism, and many have worked as seasonal employees at coastal resorts. Although the Maya of Tihosuco are certainly aware of their pre-Hispanic roots and do recognize this past as part of their heritage, the more recent past is far more locally relevant. Tihosuco was an important city during the Colonial period, serving as the capital of the region, yet it is Tihosuco’s important role in the Maya Caste War that is still celebrated today. Various monuments and tributes in the city memorialize the Caste War. Tihosuco is home to the official Caste War Museum, which houses memorabilia from the War as well as placards with detailed information about the War and Tihosuco’s role in it. 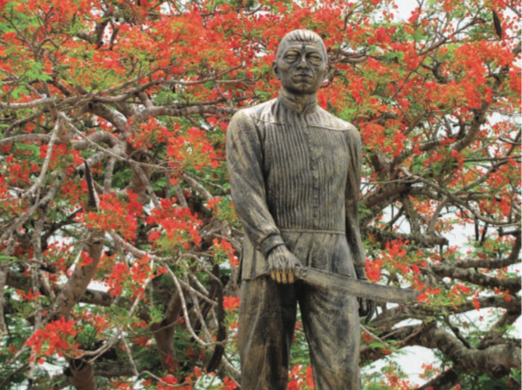 Tihosuco is also home to an impressive bronze statue of a machete-wielding Jacinto Pat — the original leader of the uprising. A native of Tihosuco, Jacinto Pat lived on a hacienda just outside of town. The now-ruined hacienda, known as Culumpich, also serves as a memorial to the war, and the land is protected and frequently visited by Tihosuqueños. Figure 10. The 19th century church (El Templo Del Santos Niño Jesus) in Tihosuco, Quintana Roo, Mexico. 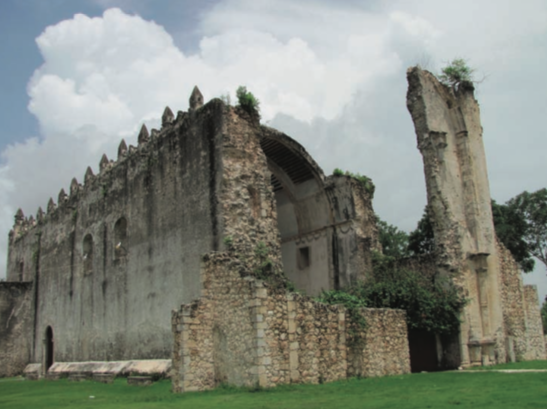 Note: the northern side of the church remains unrepaired after having been bombed during the Maya Caste War. Perhaps Tihosuco’s most impressive monument to the Caste War is the massive Colonial church located in the town’s central plaza. During the War, the church was severely damaged by bombing, and as a result, much of its southern side was destroyed. Despite the extensive damage and over a century that has passed since the Caste War officially ended, the church has never been repaired. Still used for mass every Saturday and Sunday, the church serves as a constant reminder of the events that unfolded during the 19th century. The Caste War memorials found in and around Tihosuco reflect local values and are the products of local choices. The “unrepaired” church, the statue of Jacinto Pat, the ruins of Culumpich and the Caste War Museum demonstrate that the aspects of the past that become heritage are shaped by the choices of the living. While tourism and the media may influence the ways in which international audiences understand and value the Maya past, living Maya people still have the power to commemorate their own heritage in local settings. The history of the Maya is complex and extends far beyond the parameters set forth by tourism. However, because the tourist industry caters almost exclusively to international expectations, narratives or histories that run counter to the marketable Maya archetype have been pushed aside or hidden. The onus to generate knowledge about other Maya histories falls, at least partially, to archaeologists who work in the region. The production of archaeological knowledge influences how archaeological sites as artifacts of heritage are reconstructed and marketed to the public. Consciously or not, archaeologists are in positions of power and play an important part in producing knowledge about indigenous pasts. One avenue for change is collaborative archaeology, which has increased in the Maya region and across the globe over the past two decades. Increased collaboration provides living Maya populations the opportunity to contribute to the public perception of their heritage. Furthermore, by working with local populations, archaeologists have greater potential to pursue different kinds of research questions, especially questions that have greater relevance to living Maya people. Maya communities living within and outside the tourist zone of the Riviera Maya commemorate their own heritage through a mix of practices influenced to some degree by tourist- and media-oriented narratives, as well as the remembrance of events outside the scope of tourist appeal. Practically nowhere amid the colorful attractions of Xcaret, or among the high-rise, luxury hotels of Cancún, will you find references to the 19th century Caste War, the social and political repercussions of which laid the foundations for 20th and 21st century interactions between the Maya and “outsiders.” The fact that most tourist attractions on the Riviera Maya tend to omit references to this aspect of Maya history reinforces the notion that the Maya culture and history performed for tourists is just that — a deliberate performance of an identity shaped by a mix of history and popular media narratives. Ardren, Traci. “Where Are the Maya in Ancient Maya Archeological Tourism? Advertising and the Appropriation of Culture.” In Marketing Heritage: Archaeology and the Consumption of the Past, edited by Yorke Rowan and Uzi Baram. Walnut Creek, CA: Altamira, 2004. Ardren, Traci. “Mending the Past: Ix Chel and the Invention of a Modern Pop Goddess.” Antiquity 80 (2006): 25–37. Breglia, Lisa. Monumental Ambivalence: The Politics of Heritage. Austin: University of Texas Press, 2006. Castañeda, Quetzil E. In the Museum of Maya Culture: Touring Chichen Itza. Minneapolis: University of Minnesota Press, 1996. Hervik, Peter. “The Mysterious Maya of National Geographic.” Journal of Latin American Anthropology 4, no. 1 (1999): 166–197. Medina, Laurie Kroshus. 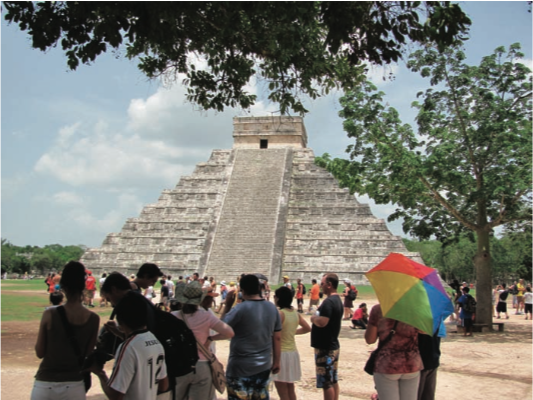 “Commoditizing Culture: Tourism and Maya Identity.” Annals of Tourism Research 30, no. 2 (2003): 353–368. Pi-Sunyer, Oriol, and R. Brooke Thomas. “Tourism, Environmentalism, and Cultural Survival in Quintana Roo.” In Environmental Sociology: From Analysis to Action, edited by Leslie King and Deborah McCarthy. Lanham, MD: Rowman & Little- field, 2005. Walker, Cameron. 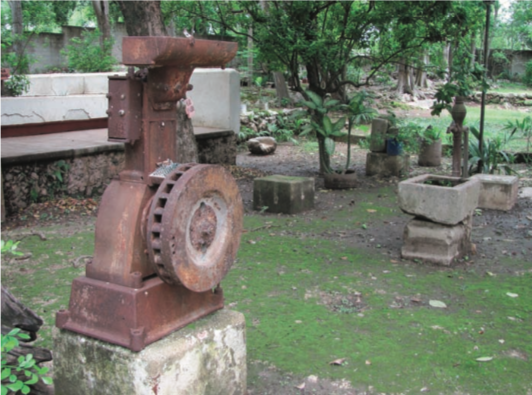 “Archaeological Tourism: Looking for Answers along Mexico’s Maya Riviera.” In NAPA Bulletin: Tourism and Applied Anthropologists: Linking Power and Practice 23 (2005): 60–76, doi:10.1525/napa.2005.23.1.60. Kirby Farah is a lecturer of anthropology at the University of Southern California. Her research and teaching interests intersect archaeology, ethnohistory and critical cultural heritage, with particular emphasis on issues of community identity and social differentiation and cohesion in the Postclassic Basin of Mexico. She is the director of the Proyecto Arqueológico de Xaltocan-Élite and recently completed an engaged archaeology project entitled Middle Postclassic Ritual Spaces and Implements: A Museum Exhibit in Xaltocan, Mexico funded by the Wenner Gren Foundation. In addition to her archaeological research, she is interested in how modern communities in central Mexico create local patrimonies around their archaeological pasts. Kenneth Seligson is a lecturer of anthropology at the University of Southern California. He is an anthropological archaeologist and a member of the Bolonchén Regional Archaeological Project in the Puuc Region of the Yucatán Peninsula in Mexico. His research focuses on the changes that have occurred in human-environment relationships in the northern Maya lowlands of the Yucatán, particularly those centered on the period of sociopolitical transformation in the eighth through tenth centuries CE. He has published his research on the environmental and socioeconomic implications of pre-Hispanic Maya burnt lime production in Latin American Antiquity, The Journal of Field Archaeology, and The Journal of Anthropological Archaeology, among other peer-reviewed journals. This entry was posted in Feature Preview and tagged Archaeology, history, identity, Latin America, maya, Mexico, tourism.